Home . Where does Lead Generation fit into the Sales Funnel? Where does Lead Generation fit into the Sales Funnel?. 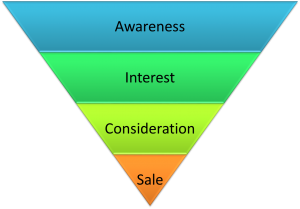 From the first time your prospects hear about you to the moment they buy from you, they pass through the stages of the sales funnel. The primary goal is to move people from one stage of this funnel to another, failure to do this will negatively affect your sales and, as a result, your revenue. Lead Generation can be used to bring in enquiries at various stages on the sales funnel. Investing time and money in lead generation can introduce more prospects into your sales funnel and generating well-qualified leads can speed up the process of moving through the different stages. During the initial stages of the funnel, prospects will get the opportunity to learn more about your company and the products or services you offer. It is important to get the tone of your approach right because the person responsible for this will essentially be the face or voice of your company and we all know how important first impressions are. Lead generation through telemarketing, networking, social media, blogging, videos and webinars will increase brand awareness and help you gain a better understanding of your customers. You will also be able to engage in conversations to better understand the market and further drill down to discover potential pain points, which the sales team can then address further down the funnel. Even if you don’t get an instant result from your first round of lead generation, you will still grow brand awareness, which will increase the traffic to your website and will subsequently lead to an increase in future enquiries. Increasing enquiries is great however if you have a high bounce rate your efforts may be in vain. Some marketers expend a lot of time and energy on increasing traffic to funnels, but if your funnel has metaphorical holes you may end up with a “leak”, in which case it may be wise to consider fixing it. Identifying and improving areas where you lose prospects will ensure that your marketing efforts remain efficient and effective.